Magazine entrepreneur Randall Lane had a prime seat at Wall Street's biggest greed fest. The Zeroes is a memoir about the excesses and bad behavior of an outsider who got pulled into a crazy, self-contained world. 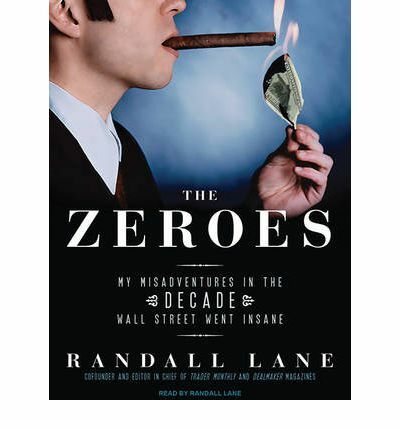 Among Randall's eye-popping true stories: -How fortunes were made, from the million-dollar score made in the thirty-minute gap between the collapse of the Twin Towers on 9/11, to the man who personally made billion from the 2008 housing meltdown.-How fortunes were spent, from Lane's ,000-per-seat trader-versus-trader boxing matches to million bidding wars for Gulfstream jets.-How Lane crossed paths with dozens of famous people who tried to cash in on the feeding frenzy or found themselves in the middle of it, including Diana Ross, Alex Rodriguez, Al Gore, John Travolta, half the 1986 Mets, and virtually every major player involved in the economic collapse.When the crash hit, Lane's company and personal portfolio were destroyed along with the high-flying traders his magazines celebrated. The Wall Street Journal called his magazines' demise "one of those moments when a chance arrow of history scores a perfect bull's-eye on a deserving target." Even Lane has to agree.In the tradition of Michael Lewis's Liar's Poker, this memoir will serve as a timeless reference when people in the future ask, "What were the Zeroes really like?" About the Author: Randall Lane is a media entrepreneur and journalist. As CEO of Doubledown Media, he founded or relaunched five magazines, including Trader Monthly, Dealmaker, and Private Air. He has written for the New York Times, the Wall Street Journal, and The Daily Beast and was the Washington bureau chief for Forbes. He lives in New York. Randall Lane is a media entrepreneur and journalist. As CEO of Doubledown Media, he founded or relaunched five magazines, including Trader Monthly, Dealmaker, and Private Air. He has written for the New York Times, the Wall Street Journal, and The Daily Beast and was the Washington bureau chief for Forbes. He lives in New York.